Now, I don’t know what the average person’s reaction to an order like this is, but as a Type A, perfectionist who had spent her whole life attempting to be responsible and do things right (just like her parents and teachers had urged her), I found it extremely stressful. I had never considered myself an artist before that class, and after, felt resigned that I never would be. 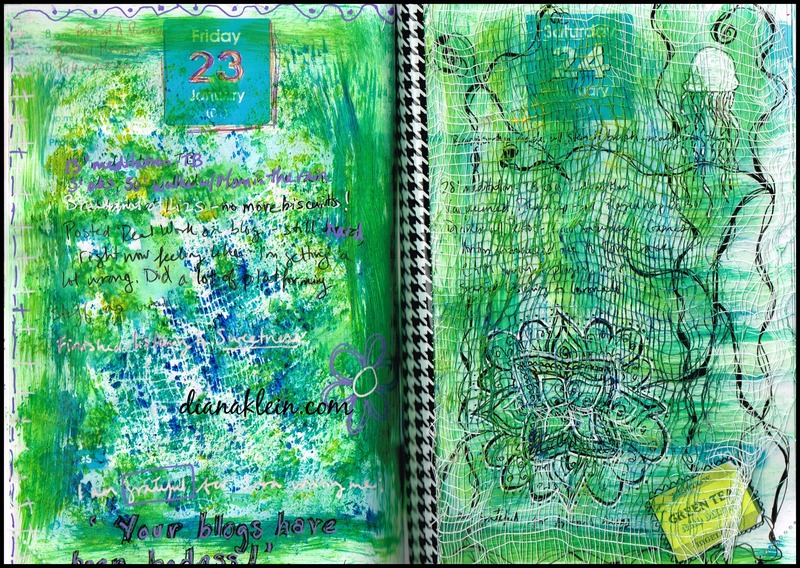 Still, I love color and pattern and texture, so, when a few years ago I stumbled on art journaling, I was immediately keen. 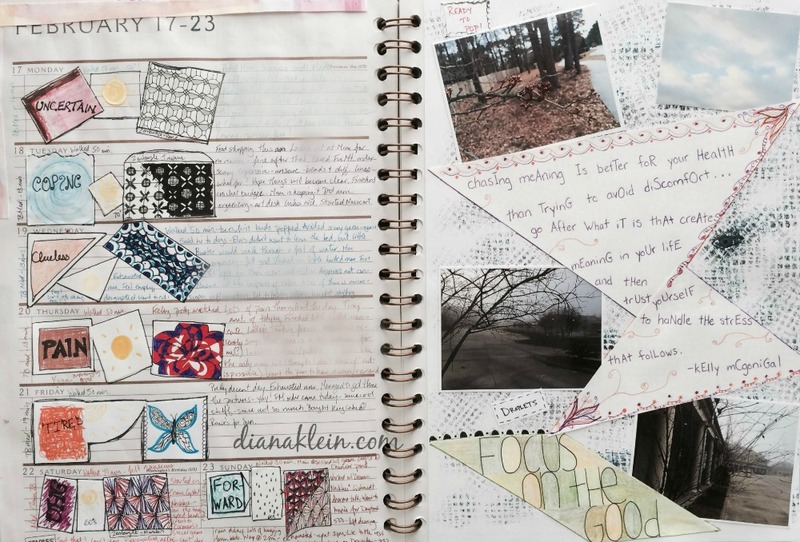 Art journaling can be different things for different people, but, in general, it’s some combination of art and writing that is done in a consistent fashion. Often, art journals are places to try new things, record events (verbally and/or pictorially), or even, just get the creative juices flowing. For me, it’s a place to play, learn, log my daily activities, and keep photos and other random ephemera. It’s been a winding road developing a practice that works for me. The first book I bought (Diana Trout’s Journal Spilling), was a lovely primer and I still have not exhausted its resources, but it told me to open my art journal to any page at random and start there. I followed instructions (I’m still quite dutiful), but not having the pages in temporal order really irked me. Also, I realized that I didn’t want to feel like I had to wait until I had finished a page artistically (a process that could take days), to do some word journaling. No Excuses Art Journaling by Gina Rossi Armfield felt like a good fit. It pares down the process by making use of a desk calendar, giving one artful tasks that help to record daily happenings and feelings. I followed this plan for a while, but, though I got a lot of great ideas, I found myself becoming boringly repetitive. I kind of love that I misspelled “ugh” in the bottom left of this page. It really shows how my brain was functioning at that moment! A few months ago, I picked up Art Journal, Art journey: Collage and Storytelling for Honoring Your Creative Process by Nichole Rae. Its process is quite different from other books of its type in that one makes entries in a computer file for several days or weeks, before printing them out, embellishing and collaging them with pictures and other artifacts into a book format. I felt energized by many of the projects in this book and even took to doing a version of her “Words I Carry” project in the calendar I was using as my art journal. The result wasn’t super arty, but it satisfied me to some degree, by adding more color and verve to my records. Nothing fancy, but at least it’s something! Soon though, I felt the itch to do whole pages again. I figured this wouldn’t be that big of a deal since my journal is really small (4.5” x 6.75”). The problem here became legibility. I wanted the journaling to be readable since a lot of what I put into my journal are log notes and it’s important for me to be able to go back and track my activities and the way I was feeling. What a mess! I love the gauze (a blood draw souvenir) taped in between the pages, though. At first, I decided that I would write on the individual calendar dates and, through the wonders of washi tape, attach a small piece of art that I would complete daily. This was cool, but I realized that some days, I didn’t have much to write—or felt too lousy to write at all—and, as a result, had all this insipid white space glaring at me. A little Zentangle on the left and a thank you note on the right, but still too much white! More misspelling. Word journaling is hidden beneath these flaps. I love that I used up a few paper scraps. Recently, I decided to switch. I art journal directly on the calendar pages (the paper’s not exactly what you’d call artist grade, but it’s fun to see how it reacts with various media), and tape in my log/journal notes as I go. This allows me to work on an arty page for more than one day and provides for those days when I just can’t get to writing. The writing on the left is an example of my taped in journaling. 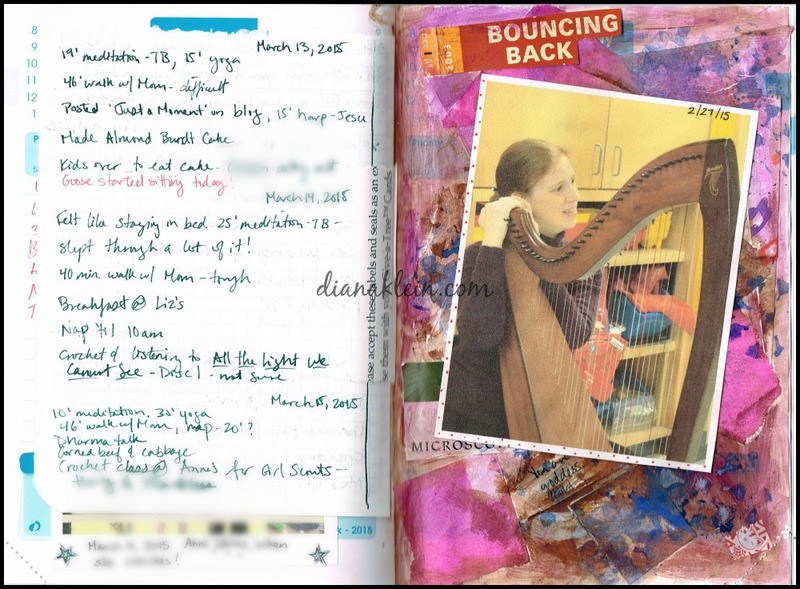 I began the page on the right with acrylic and collage not knowing what might become of it, but when I was looking for a place to put a picture from my harp presentation a few weeks ago, it seemed like a good fit. Is it finished? I’m not convinced. I don’t know if or how long this strategy will work, but for right now I am enjoying it. I love looking back at my old entries. Even though I am primarily a writer, I find that the illustration, so to speak, reveals so much more about what I was thinking and feeling. And because it’s all just for me, it doesn’t matter what it looks like. If something turns out terrible, I just laugh and say to myself, “Well, that sure didn’t work!” This is the main reason I value my art journaling—because it’s one of the few areas in my life where I can easily have that kind of attitude. I consciously tell myself not to think, just act. It’s a safe place for me to leap without looking and, even, you know . . . relax. An experiment with pastels gone horribly wrong? Or the beginning of a cool new page? Only time (and more art journaling) will tell. 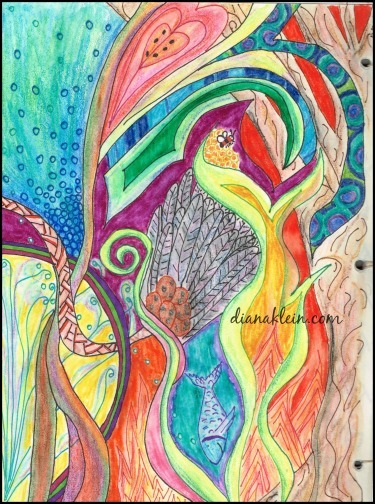 Julie Fei-Fan Balzer does a weekly Art Journal post on her blog, has a whole section of her site devoted to it, AND she has all kinds of other cool arty stuff on her site. I cannot recommend it highly enough. Just go there and subscribe to her blog already. France Papillon’s site—a totally different almost subdued look, but with a lot of interesting texture and other design elements. 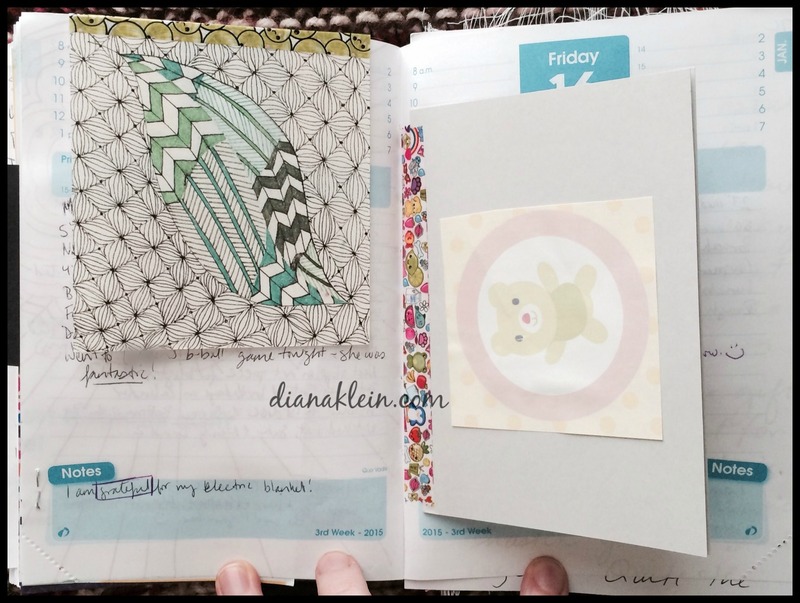 She also offers a weekly video tutorial of her work in her own art journal! Awesome post! 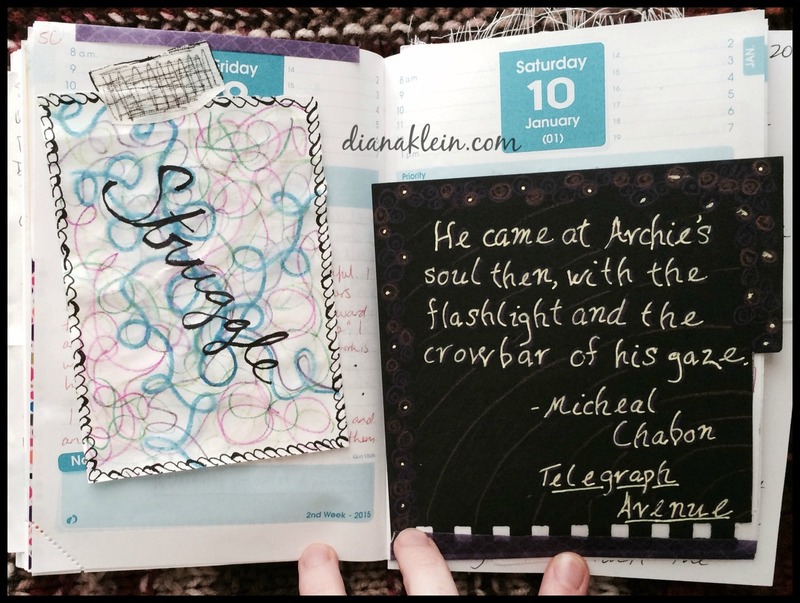 It’s fascinating to read your story of how your art journaling has evolved! Thanks for sharing Diana! Thanks so much, Michelle. I went to your site and it is gorgeous!! Wow! Thank you for this post! I too have been inspired by Nichole Rae’s book. 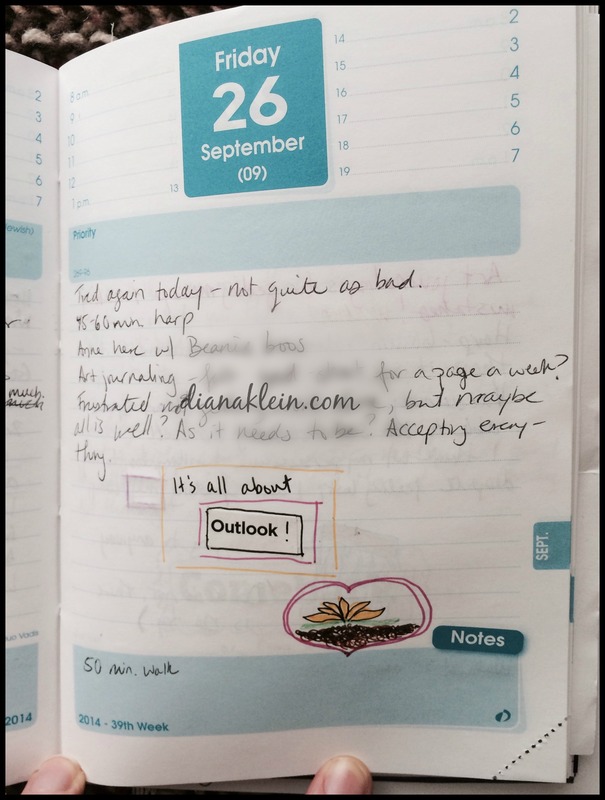 I tried her way of journaling and it worked for a dozen or so pages. Then I found myself not wanting to art journal any more because the pages just weren’t me. And I am struggling to find a method that works. I am going to try the Documented Life Project next. Thank you again. Hi, Diane! I’m sorry it’s taken me so long to get back to you. I’m glad this post was meaningful to you! 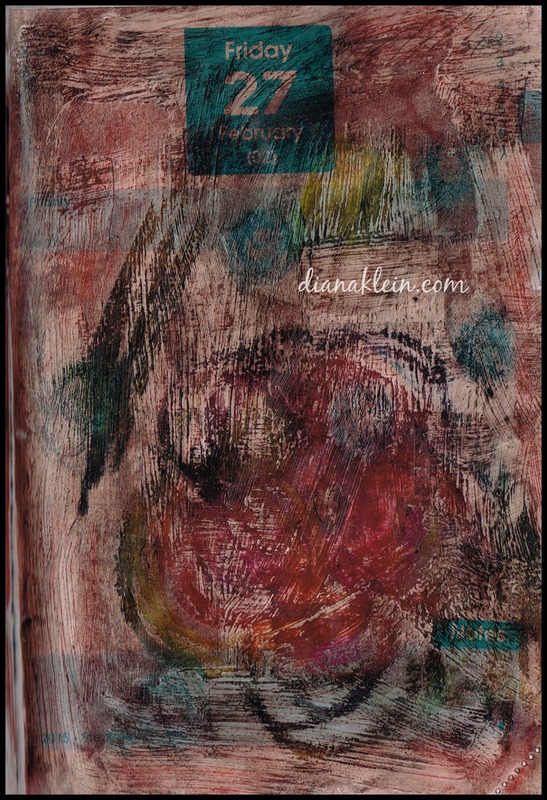 I still find that my art journaling practice is continually evolving. I have yet to find a rhythm that I’m really satisfied with, but I make a priority to do something arty at least once a week. Best wishes on your art journeys–wherever they may take you!